Quickly sanity checks, searches and documents ZENworks NAL objects. ...... and file data, inappropriate distribution of system DLLs, applications with no associations, slow to distribute apps and general deviations from Novell best practices. Along with providing detailed reports of NAL issues and potential resolutions, it also has various other in-built reports which aid documentation and provide detailed information on application attributes, associations, fingerprints, run orders, macros, flags and more. 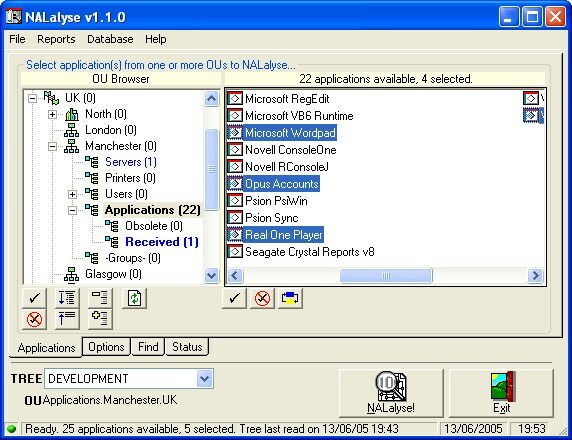 The search tool in NALalyse allows you to quickly scan hundreds of NAL objects within minutes, identifying applications distributing specific registry entries, files, INI and Text entries etc. - great for tracking down applications trampling over system files and causing Windows File Protection events. In this version, the search functionality has been improved and now allows you to search NAL objects for less 'defined' data such as 'IP Addresses', 'Executables' and 'Microsoft Documents'. Qweas is providing links to NALalyse 1.2 as a courtesy, and makes no representations regarding NALalyse or any other applications or any information related thereto. Any questions, complaints or claims regarding this application NALalyse 1.2 must be directed to the appropriate software vendor. You may click the publisher link of NALalyse on the top of this page to get more details about the vendor.